The beaver is one of a few mammals, other than man, capable of modifying the habitat to suit its needs. When beavers move into an area, they quickly begin building dams to modify the habitat more to their liking. Once the dam has been built from surrounding trees, the subsequent flooding causes the trees to die and other aquatic plants to begin growing. Often the new plant growth around the edge of a pond (willows, blackgum, and sweetgum) are preferred beaver foods. Beavers feed on the cambium layer (just under the bark) of woody plants and a variety of aquatic and upland vegetation. Preferred woody foods include willows, birch, maple, alder, cherry, and poplar, although they can and will feed on the leaves, twigs, and bark of more than 40 woody species. During the summer, they also eat water lilies, pond weeds, and cattails. Sometimes beavers travel substantial distances from the pond or stream to get to corn or soybean fields, where they cut the entire plant off at ground level and drag it back to the water. What they do not eat, they use for constructing dams and lodges. Mostly found roosting under loose bark or in the cavity of a tree. However, they will also utilize caves and cracks in rocks. They have also been found in buildings and under eves. In the winter time, they either hibernate living off of stored fat, or they migrate to warmer climates where food is still available. 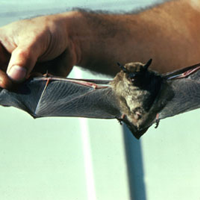 Big Brown Bats are insectivore, so they only eat insects. Including beetles, wasps, bees, flies and more. Usually hunting above the tree canopy, they are one of the first bats to emerge in the evening. They find their food using echolocation. Though traditionally believed to be adapted to live in open areas, coyotes have expanded into most types of habitats. While they do well in agricultural communities, their relatively high tolerance for human populations allows coyotes to exist in most areas of South Carolina. This includes mountainous regions, swamps, dense forests, as well as suburban areas. 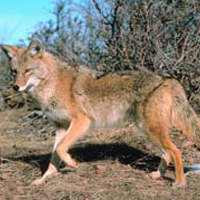 Coyotes are opportunistic feeders, preying upon rabbits, rodents, and other small mammals, supplementing their diet with fruits, berries, and insects. They will eat carrion and will also prey upon deer fawns and occasionally on adult deer. One study on the Savannah River Site in Aiken County revealed that coyotes were preying upon more than half the deer fawns born. These rabbits seek out habitat on the fringes of open spaces, such as fields, meadows, and farms, but can adapt to other habitats—including those of humans. They browse at night on grasses and herbs and are fond of garden fare such as peas and, of course, lettuce. In winter, their diet becomes a bit coarse and consists of bark, twigs, and buds. 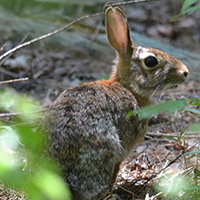 During the day, cottontails often remain hidden in vegetation. Cities, suburbs & towns, meadows & fields, scrub, shrub & brushlands, grasslands & prairies, forests and woodlands. Active year-round, and feeds on a variety of invertebrates including earthworms and ant larvae. About 99% of their time is spent underground, in tunnels and associated chambers. Flying squirrels live in deciduous and coniferous forests and woodlands. They make their homes in snags, woodpecker holes, nest boxes, and abandoned nests of birds and other squirrels. Sometimes multiple squirrels will nest together to keep warm in the winter. Flying squirrels are omnivores. They eat a variety of foods including seeds, nuts, fungi, fruit, and insects. 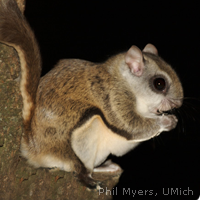 Southern flying squirrels are considered to be one of the most carnivorous squirrels because they supplement their diet with eggs, birds, and carrion. The gray fox is considered a woodland inhabitant. While it benefits from an interspersion of forests and fields, it can also be found in fully timbered areas. In mixed areas of open land and woods, gray foxes’ ranges may overlap those of red foxes. Unlike the red fox, the gray can climb trees and does so occasionally to escape predators and hunting dogs. 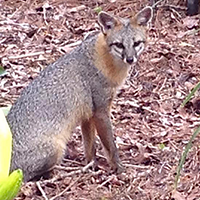 The gray fox’s ability to climb and its adaptation to completely forested areas may explain why they have not been displaced by coyotes, as red foxes have in some areas. The primary food of the gray fox is small mammals such as rats, mice, and rabbits. They have been known to occasionally feed on poultry, small birds, and insects. Plant foods are more important to the gray fox than the red fox. Grays commonly eat persimmons, grapes, and acorns. They will also eat carrion. Hollow den trees are essential to squirrels for winter shelter and rearing of young. Research has shown that survival of litters is usually about 2.5 times as high in den trees as in leaf nests. Adult females with young will not tolerate other squirrels in the same den tree. Considering that only about 50 percent of the hollow trees identified from the ground up as suitable den trees, plenty of hollow trees are needed to satisfy the squirrel population. Known den trees should be marked and protected from cutting. Adult squirrels usually frequent at least two den trees located in their home range. Home range size varies from about 1.5 to 8 acres for individual squirrels, with many ranges overlapping. 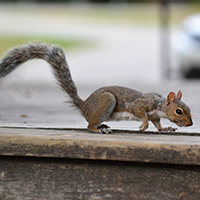 Squirrel reproduction and survival fluctuate with the changing availability of heavy-seeded mast (fruit from trees or shrubs), particularly acorns. When the heavy mast is not available, squirrels feed on other fruits and berries, floral parts, buds, bark, roots, mushrooms and some animal matter. About 1-1/2 pounds of mast per week is required for one squirrel from September through March. While most people think of bats living in caves, in the summer time bats live behind bark, in tree’s, jungles, and man-made structures such as buildings, barns, and bridges. 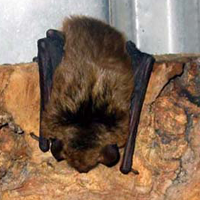 Little Brown Bats are insectivore eating mostly flying insects. Including beetles, wasps, bees, flies and more. Usually hunting above the tree canopy, they are one of the first bats to emerge in the evening. They find their food using echolocation. Muskrats live in a large variety of habitats. The habitat for muskrats is almost anywhere they can find a year-round supply of food and water. 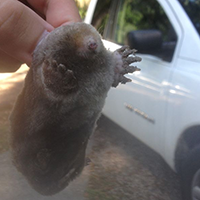 They are found in ditches, streams, marshes, lakes, beaver ponds, mine pits, farm ponds, or any wetland area. For shelter they use bank burrows, houses built of vegetation and feeding huts. Bank burrows are usually 6 inches by 8 inches and are up to 60 inches long. Muskrats use bank dens mostly during the summer. Muskrats are vegetarians and relish cattails, bulrush, smartweed, duck potato, horsetail, water lily, sedges, young willow sprouts, and pickerel weed. 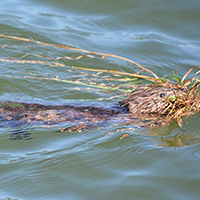 Muskrats will eat almost any aquatic vegetation, including the bulbs, roots, tubers, stems, and leaves of numerous wetland plants. They occasionally eat corn, soybeans, grain sorghum, and small grains. At times, particularly during periods of low food supply, muskrats will eat animals, including crayfish, mussels, turtles, frogs, or fish. The nine-banded armadillo inhabits the dense shady woodlands or pine forests. They are found in a warm and rainy environment, mostly in the in those regions that resemble their ancestral home. They are found in Peru, North Argentina and some regions of USA. They stay in deep burrows during the day but are more active at the night. They cannot stay in cold and dry environments since they are only susceptible to dry and hot weather. It is also found in forests and rainforests. It is an easily adaptable animal, and therefore can easily thrive in any region in open prairies, scrublands, and rainforests. It prefers sandy or loamy soil to stay so that it can easily be excavated. They have many burrows, but they up one to bring up their young one. 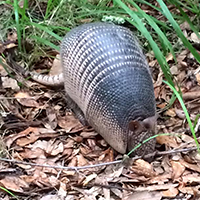 The nine-banded armadillos are insectivores. They collect their food by digging the soil with their snouts in the soil that they select is loose. They also have a long tongue, with the help of which they grab ants, grubs, termites, and worms. They had peg-like teeth. Their tongue is sticky; therefore they can wrap up the insects in their tongue. This diet is accompanied by small reptiles, amphibians, and tubers. Raccoons occupy a variety of habitats but are mostly associated with aquatic areas. 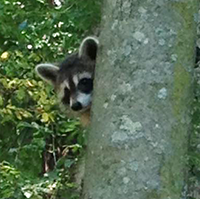 Raccoons are common in the coastal marshes and in bottomland hardwoods. Swamps with mature hardwood timber are preferred because of the availability of food and den trees. Other important areas are wooded streams flowing through agricultural areas and beaver ponds. The conversion of hardwoods to monoculture pines, the destruction of streamside timber, and development of coastal islands have reduced raccoon numbers in some areas. Raccoons commonly feed on crayfish, clams, frogs, salamanders, snails, and turtles. They are infamous predators of bird nests, particularly waterfowl. The diet also includes a wide variety of plant foods including acorns, berries, and wild grapes. During the winter months acorns may compose as much as 50% of the diet. During certain seasons of the year raccoons invade agricultural fields to feed on corn, watermelons, and peanuts and can cause some damage. Raccoons will scavenge on carrion and often invade household garbage. The red fox favors open areas mixed with small woodlots and hedgerows. In the Pee Dee region of the state, it has found an ideal home around tobacco fields and commonly digs dens under old abandoned tobacco barns. Since red foxes do not climb trees like gray foxes do, they use underground dens for escape and resting. Red foxes are also numerous on the pasture lands of the Piedmont region. 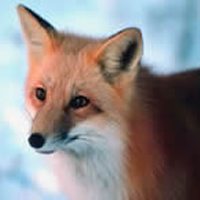 Red foxes feed on rabbits, mice, birds, and insects and also eat fruits and berries. Carrion will be eaten when found. They are opportunistic feeders, taking any acceptable food in proportion to availability. Otters prefer a wide variety of aquatic and wetland habitats. In general, otter habitat consists of any area that has a stable water level, an ample food supply (primarily fish), and no water pollution. 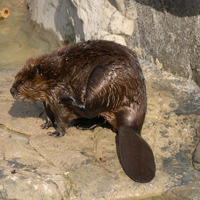 Home to an otter is a beaver lodge, overhanging bank and previously excavated burrow, or root wads. Many river otter den sites are of beaver origin, either bank dens or lodges. Otters frequent these sites even when beavers are present in the lodges. Otters have also been observed using man-made Canada goose nesting platforms as daytime resting sites. The feeding habits of river otters have been extensively studied. Otters are primarily fish eaters, although crayfish are also a favored food. 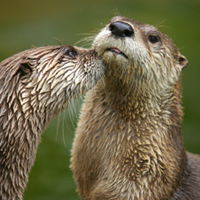 Snakes, frogs, salamanders, snails, insects, clams, earthworms and a variety of mammals and birds have been recorded in otter diets. Otters’ feeding preference is usually based on what is available at the specific location. In the southern portion of their range where fish productivity is high, otters eat fish but eat crayfish when they are available. The relative abundance of various fish species and their maneuverability determine which fish species are eaten. This means that otters prey more on slow moving fish than on faster-moving species. 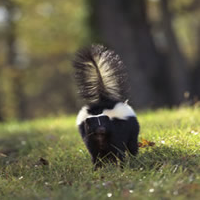 Skunks use a variety of habitat types, preferring woodlands, semi-open farmland, and old abandoned fields. They are often found around farm yards, and their habit of denning under farm buildings and homes causes some problems. In forested areas skunks den in rock piles and under the roots of blown-down trees, or they use their well-developed claws to dig a den in the side of a bank. Skunks are omnivorous in their feeding habits. Insects are very important, particularly for striped skunks. Other animal matter eaten includes mice, rats, frogs, salamanders, small birds, and eggs. Fruits, berries, and grains supplement the diet in the summer months. The opossum is one of the most adaptable animals in North America. The diversity of food items it will utilize allows it to live in almost all habitats in South Carolina. 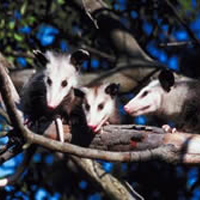 Opossums thrive in both woodlands and farmlands and are also commonly found in residential areas. The opossum diet is the most varied of all furbearers, with insects being the most important item. Opossums are known to eat fruits, crayfish, snails, worms, frogs, salamanders, dead fish and other carrion, mice, snakes, birds’ eggs and sometimes even birds and rabbits. Quality deer habitat includes a mixture of trees, shrubs, vines, forbs, grasses and other plants such as fungi and sedges. Certain plants within each of these categories benefit deer more than others. Desirable plants should be well interspersed throughout an area so that the whole area functions as deer habitat. Some water source should be available every mile or so. Enough area with appropriate plants should be available to support a viable population. 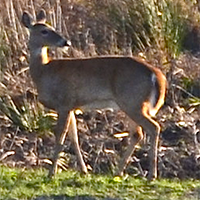 White-tailed deer are extremely adaptable in their food habits. Deer consume primarily wild herbs, fruits, and agricultural crops; however, they can survive on the leaves, buds, and twigs of woody trees and shrubs when other foods are scare. When abundant, acorns are the mainstay of the fall and winter diet.